On arrival in Inverness, the Canadian midfielder heard plenty of tales of the former Blackburn Rovers winger’s talent, trickery and heroics in the Premiership and Scottish Cup. With Doran having to make a long recovery from two traumatic knee injuries, Trafford secretly dismissed it all as hyperbole. But all scepticism has now vanished, with Doran hitting explosive form in the last couple of months. With six goals from the flanks in the last 10 matches, the winger’s productivity and performances have been at the heart of Caley Thistle’s rejuvenation in the promotion race. Trafford, himself hitting fine form in a side now flying with five wins from six, admits Scottish Cup winner and past Europa League peformer Doran’s renaissance has been brilliant to watch. The 26-year-old, from Calgary, said: “The way Aaron is performing right now is huge for us. “When I first arrived at the club, there was big talk about this guy Aaron Doran who came from the Premier League. “I’ve been here a year and a half and I was starting to think everyone was lying to me and that Aaron wasn’t that good! “But he’s been brilliant – and it is so good to see. “He has overcome a lot, some really bad injuries, and he is showing genuine class at the moment. “Like the rest of us, I hope he can keep up the momentum. “If he keeps flying, it gives us a lot of confidence. We know if we keep a clean sheet or keep it down to one goal, we’ll always have a chance with guys like him up front. “Tom Walsh coming back into fitness and form gives us two wingers terrorising defenders and big Jordan White up front has been a handful lately too. For all his exuberance, Trafford has feet firmly on the ground – even at home to bottom side Alloa. 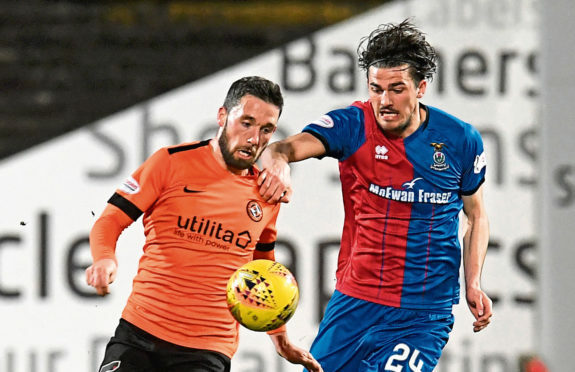 Some 16 points and six places separate tonight’s adversaries, but Caley Thistle have failed to beat the Wasps in two drawn matches so far this season. On top of that, for all the Highlanders’ momentum, home form has been problematic this season with just three league victories from 13 attempts at the Inverness ground.